Justice Raul A. Gonzalez was born and raised in Weslaco Texas, graduating from Weslaco High School in 1959. He is the second oldest of five children. His parents, both born in Mexico, were migrant workers. Justice Gonzalez worked alongside his parents, aunts and uncles harvesting crops in the Valley, Arkansas, and Washington. He also had odd jobs like shining shoes and sacking groceries at HEB. Justice Gonzalez has been married to his wife, Dora, for almost 52 years. They have four adult children and three grandchildren. After graduating from Weslaco High School, Justice Gonzalez worked in California picking apricots and a tomato packing shed. He graduated from the University of Texas in Austin with a degree in Government, earned a law degree from the University of Houston and an LLM from the University of Virginia in 1986. Justice Gonzalez has been a legal aid lawyer, a prosecuting attorney, a defense attorney, and a judge. He has spent twenty years in the judiciary as a district judge in Brownsville, a court of appeals judge in Corpus Christi, and a Justice of the Texas Supreme Court in Austin. 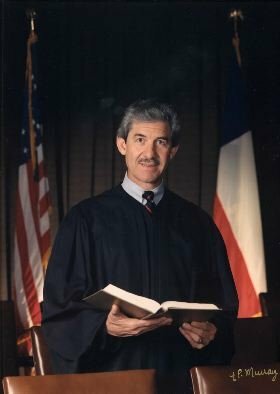 He has the distinction of being the first Hispanic to serve on the court of appeals in South Texas, the first Hispanic to serve on the Texas Supreme Court, and the first Hispanic to be elected to a statewide office. He is currently a lawyer in private practice, residing in Austin for the last 18 years. Justice Gonzalez and his wife Dora are involved in the ministry, active in their parish, and are a presenting team in Marriage Encounter, a weekend for married couples who want to improve their marriages. They have presented these marriage enrichment programs all over the United States, Brazil and Bolivia. While he and his wife have participated in missionary trips to Mexico and he has the privilege to go on missionary trips to Albania, Korea, and Panama. Justice Gonzalez serves on the University Of Houston Board Of Regents and is a volunteer lawyer at the Travis County Legal Aid. Quiero concluir con, "El Juez Raul A. Gonzalez es humilde, honorable, y noble."